This dressing/dip/sauce? It’s pretty amazing. The flavors punch you in the face – in a good way. Kind of unexpected and totally delicious. 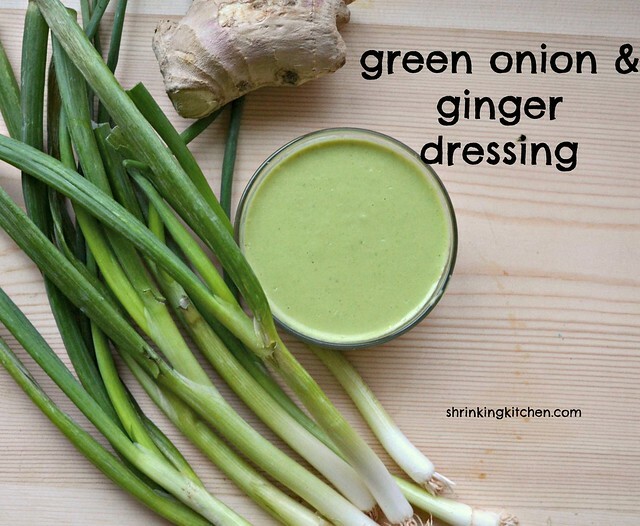 You might wonder why I decided to come up with a dressing based on green onions? Well, my CSA decided I needed four bunches this week. FOUR BUNCHES. I still have tons leftover, but I’m guessing I’ll be making more of this dressing – it keeps beautifully and is not only wonderful on salad, but I’ve also been drizzling it over grilled chicken and fish. It’s also perfect as a vegetable dip – I really enjoy it with cucumbers and red peppers! This green onion dressing comes together in no time in a blender. Depending on how powerful your blender is, you may have to chop more or less. I literally cut the green onions in half and threw in a lump of ginger, topped with the rest of the ingredients and let ‘er rip! So quick. One more thing before you run off and make this (and you should! ), this dressing is…wait for it…dairy free. Refined sugar free. And if you use the liquid aminos, gluten free. It’s just glorious and nourishing. Enjoy! Turn on and gradually increase speed. Blend until it's creamy with no chunks. Oooh! You should save your green onions by freezing them. I love the idea of putting them in an empty water bottle. This sounds really delicious! Thank you!